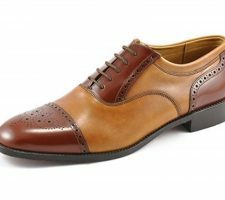 Loake Drake Shoes Review - MR ELLIS ! 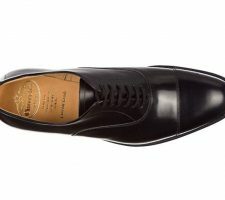 The Loake Drake is very much a classic derby with no additional embellishments. If you’ve been thinking about adding a derby to your shoe arsenal but you weren’t sure which brand to choose, allow me to recommend the Loake Drake – I can confidently say that you won’t regret it. Loake is a sacred name among shoe lovers, and for good reason: They’re a legendary British shoemaker with a history of quality craftsmanship that extends back to the late 1800’s. In today’s times in particular, it’s rare to find any kind of company with such a rich heritage, but Loake has managed to stay true to its roots while still efficiently accommodating the increasing demand for its footwear. Over the decades (and I could almost say centuries), Loake has continued to methodically expand their product line to include a wide range of popular yet classic styles, one of which is the Loake Drake derby shoe. I’m going to focus on the Drake for this review, so let’s get to it! 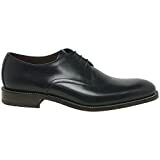 The Loake Drake is the quintessential derby-style lace-up shoe, with both leather uppers and liners. To the untrained eye, this shoe would seem to suit formal applications only, but interestingly enough, the derby has taken on a new life in recent years (especially among the #waywt Instagram crowd). In fact, in today’s fashion zeitgeist, the derby can act as a very capable crossover shoe for both formal and informal ensembles. The derby’s newfound reputation as a “style chameleon” has made the Loake Drake a highly popular choice among shoe enthusiasts, and the fact that the Drake comes in the perennially versatile colours of black, brown and tan makes this shoe a no-brainer when you’re looking for the perfect accent to a smart, stylish outfit. The Loake Drake is very much a classic derby with no additional embellishments (e.g., broguing, heel caps or cap toes), and it fastens up via three pairs of eyelets in an open lacing system. This stands in slight contrast to the oxford, which features a closed lacing system. Although this is a very minor detail, it is the primary reason why oxfords are often considered to be more formal then derbies, although both shoe types are equally capable choices for formal occasions. The simplicity of design that the Drake offers gives it a stylish yet understated look that can easily complement a wide range of clothing choices. It’s very hard to call Loake’s quality into question, and this definitely holds true with the Drake. 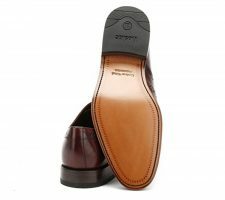 The shoe features Loake’s legendary Goodyear welted construction, which already sets it apart from its competitors due to the attention to detail and exquisite craftsmanship required to produce shoes in such a manner. Loake is above reproach in terms of their commitment to quality, and as I can personally attest, these shoes are built to last. The uppers and soles are very strong, so they retain their shape and appearance even after frequent use. I wear my Drakes quite often during the average work week, and they have held up exceptionally well, even for someone like me who doesn’t necessarily go easy on their shoes (I have a pretty heavy tread). This doesn’t mean that I treat my shoes any old way, though – I do at least make sure to keep shoe horns in my Drakes when I’m not wearing them! When your feet are encased in high-quality leather, it’s hard to feel anything but comfort. This is very much the case with the Loake Drake; these shoes have the perfect combination of support, flexibility and breathability due to the exceptional quality of the materials used in their construction. The Drake is moulded to the “Claridge” last, which gives it an F fitting (a.k.a. medium or 6 fitting). I have flat feet (which means that they widen out a bit when I put weight on them), so I ordered the Drake about a half-size larger to ensure that I wouldn’t miss a beat in the comfort department. Fortunately, these shoes did not disappoint. The fact that the Drake carries the Loake name should already make it a shoe-in (pun completely intended) for your collection. Not only that, but with the derby enjoying a renaissance as a veritable “Swiss army shoe” for both formal and casual wear, there are simply too many fashion possibilities here for you to pass it up. If you’ve been thinking about adding a derby to your shoe arsenal but you weren’t sure which brand to choose, allow me to recommend the Loake Drake – I can confidently say that you won’t regret it. Sam started the MR ELLIS ! blog with aim to provide his readers with plenty of tips and tricks to help them fine-tune their style. His motto is that you don't have to spend ridiculous amounts of money to look like a well-dressed gentleman. 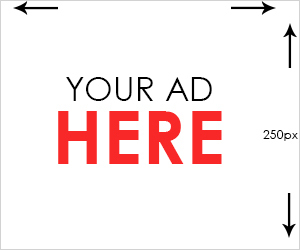 MR ELLIS is a participant in the Amazon EU Associates Programme, an affiliate advertising programme designed to provide a means for sites to earn advertising fees by advertising and linking to Amazon.co.uk. Amazon and the Amazon logo are trademarks of Amazon.com, Inc or its affiliates. Copyright © 2019 by MR ELLIS !.